Lefties have it hard in guitar world. They might only be 10% of the world but studies have shown them to be the most creative bunch of the lot. The problem arises when they wish to take that creativity into music – or worse, into playing guitar. It’s actually not as bad as we’re making it sound, even if many people fall for it. 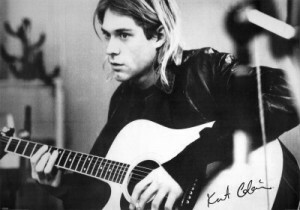 Remember that Kurt Cobain, Paul McCartney and Jimmi Hendrix were/are all left-handed and amazing guitarists. We’ve had many parents ask us what to do if their kid’s left-handed and wants to learn guitar. The answer’s simple: let them! Learning how to play guitar when you’re a lefty isn’t harder than when you’re a righty. The only problem you’d have to figure out beforehand is how he or she is going to learn in the first place. – Play guitar like any right-handed person would do. – Buy a left-handed guitar and learn on that one. – Re-string a regular guitar to play it upside-down. Surfing around the web we found that almost 50% of all lefties play guitar like any right-handed person would do. This makes sense: by learning the righty way, you’re still able to pick up any guitar at any gathering and play on the spot without having to carry your guitar everywhere. Some even say this plays to lefties’ advantage – your ‘good’ hand is on the fretboard and therefore, you can pick up on fretting easier. Of course, this means that your other hand is strumming, making picking and speed a bit harder to grasp. Yet it’s completely doable, like Paul Simon, Mark Knopfler, Steve Morse and David Byrne have shown the world. But sometimes a kid is just too left-handed to actually grasp right-handed playing. What do we mean by this? Well, as most things in life, right- and left-handedness are not black and white. Think of it as a spectrum. Even if someone uses their left hand to write, that doesn’t really mean they use their left hand for everything. The same goes for righties. In fact, we know several right-handed guitarists who actually prefer to play with left-handed guitars. Yet left-handed guitars continue to be sparce and more expensive than regular ones. So what’s one to do? This third option is what we usually recommend. The best solution for lefties is to go “Hendrix style” and simply switch the string order. In fact, I’m a lefty myself -as you can see on the video below- and that’s the way I do it. All Loog Guitar models work great this way because the strap buttons are placed in the center of the body. Therefore, your kid can easily learn to play guitar with three strings even while being left-handed… who knew the Loog Guitar was ambidextrous! The Loog Guitar in Action from Loog Guitars on Vimeo.